Monarch numbers around Cape May Point have remained fairly steady, as expected with the continuing east and northeasterly winds. The forecast is now calling for several rainy days later this week, some mixed with strong winds, and the possibility of very heavy winds if tropical storm Joaquin decides to visit. The long-range forecast looks good for an influx of monarchs next week; we'll cross our fingers and keep watching the forecasts. Hello. Thanks for the info. 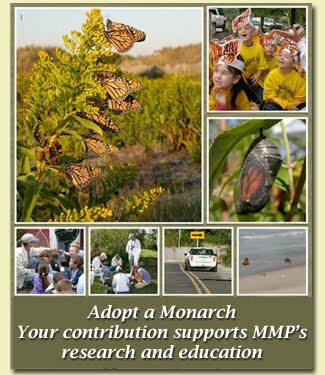 I have been waiting for this time to see the monarch butterflies in Cape May. I am a Science teacher at Long branch and I am looking forward to taking some great pictures to display in my classroom. Can someone change the wind, please?